Yangon is the cultural and commercial centre of Burma, now Myanmar, with the port lying twenty one miles north of the Gulf of Martaban at the junction of the Yangon and Bago (Pegu) rivers. 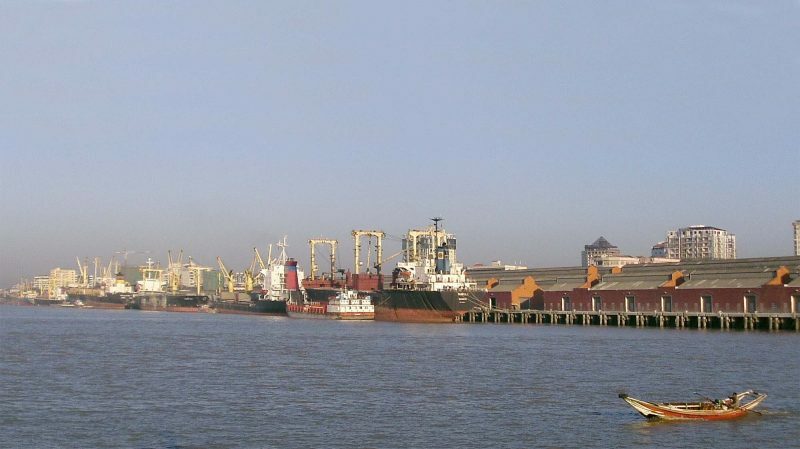 It handles over 36 million tonnes of cargo per annum, with the city formerly known during the British period as Rangoon, the Anglicized version of Yangon. The population of the town was only ten thousand people in 1824, but the British established hospitals including Rangoon General Hospital and colleges including Rangoon University for the growing population. Parks and green open spaces, and the Rangoon Zoological Gardens, earned the growing city the title of ‘The Garden City of the East’. The Mahabandoola Gardens near the port are famous for its rose gardens that surround the Myanmar Independence Monument, a tall white pinnacle in the middle of beautiful flowering borders. They were originally named after the Chief Commissioner of British Burma, Albert Fytche, but were renamed in 1935 after General Mahabandoola, leader of the Burmese resistance in the First Anglo-Burmese War of 1824/26. They are a lovely place to sit and have a good view of the many old style British colonial buildings of the city, built in the ‘Neoclassical’ and ‘Indo-Saracenic’ styles of architecture. The population in the inter-war years had grown to almost half a million, with Burmese, Indian, South Asian, Chinese, Anglo-Burmese and other racial groups such as the Karen people of Southern Burma. The latter racial group make up 7% of the Burmese population with five million people now living in Yangon city, Southern Burma, and on the Burmese and Thai borders. The women are famous for wearing traditional and elaborate neck rings, and this ethnic grouping waged a war against the central Burmese Government from 1949 to 2012, fighting for the right to govern their own State. Burma and Yangon were under Japanese military rule during World War II, with Rangoon Docks almost completely destroyed by the Japanese on their withdrawal in May 1945. 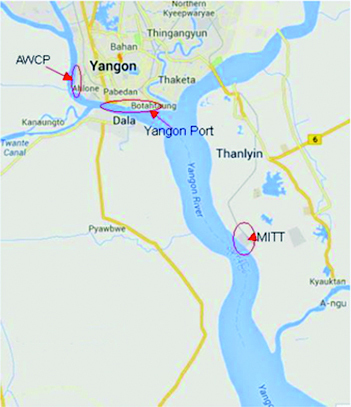 Yangon is a major exporter of rice and rice products, as well as of teak and hardwoods from the mountains to the north. The country is self sufficient in oil from deposits in the north, and natural gas production is increasingly important. The primary religions are Buddhism, Christianity, Hinduism and Islam, with secessionist moves in Muslim Arakan State. The population of Yangon is expected to reach 6.361 million by 2020, but few have mobile or landline telephones, with the telephone penetration only 6% to 10% during the last decade. The high cost of telephone networks, computers and the heavily restricted Internet and local Intranet by the military government are the reasons, with Internet cafes the only solution. The media is heavily censored by the military government Press Security and Registration Division, with the editors of newspapers careful to publish only editorial content in line with Government policy.